Before wrapping up Summer Cocktails Week, I wanted to share some of my favorite resources for recipes, tips, techniques and inspiration. 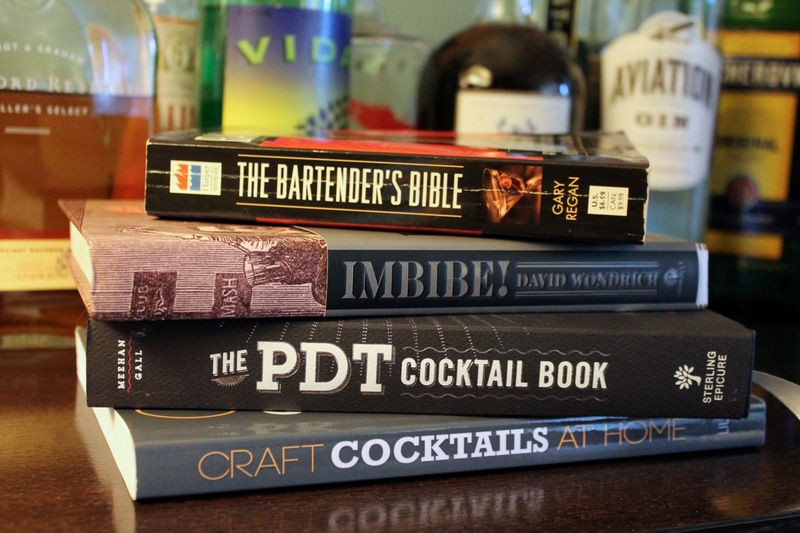 The PDT Cocktail Book by Jim Meehan. Meehan, the bartender at New York's speakeasy Please Don't Tell (PDT), has written one of the most celebrated cocktail collections in recent years. He details the sources and inspiration behind each drink, with a healthy mix of classic, updated and creative drinks. Imbibe! by David Wondrich. "Classic" cocktails--those originating sometime before 1920 or so--have been all the rage lately, and Wondrich's book is a wonderful resource for recipes from that time as well as history, focused around the biography of Jerry Thomas, a bartender credited as publishing the first bartender's guide in 1862. Craft Cocktails at Home by Kevin Liu. This is the book I reviewed Monday. If you want to go beyond recipes to get a better understand of the techniques and science of mixology to help guide your creativity, this is an excellent read. Jeffrey Morgenthaler. Morgenthaler is the bartender of Clyde Common in Portland, Oregon, and his cocktails blog, which has been around for years, is a treasure trove of authentic recipes embellished by his entertaining writing. Sadly, he hasn't added a post since August of last year, but there's still a lot of great archived content here. Alcademics. This blog is the product of celebrated cocktail writer Camper English and it features excellent recipes, tips and techniques. Drinking in America. This blog isn't just about cocktails, as it covers the whole range of alcoholic beverages. In addition to cocktail recipes, it's a great place to find out about new and up-and-coming products. The Boys Club. With beautiful photos, delicious recipes and interesting "101-style" history posts, The Boys Club, which goes beyond just cocktails, is a good site to get ideas. Cannot end this list without mentioning that one of the best resources is the local talent. Frequenting bars known for making delicious, quality cocktails is one of the best ways to get inspiration and learn more about what works. Taste something you really like? Why not ask the bartender how he or she did it. I'm lucky that I live in a city blessed with a great number of amazing bars and restaurants with notable bars. Some of my favorites include Jaleo, Range, Ripple, Palena, Poste, Fiola, The Passenger and Jack Rose. A few that I haven't tried but would really like to are Buffalo & Bergen (in Union Market), The Gin Joint (New Heights), Columbia Room (behind The Passenger), PX (in Alexandria), Estadio and Churchkey (upstairs from Birch & Barley). And there are many, many more. I might add another tip: Marry someone like Andrew who knows how to mix a good drink.